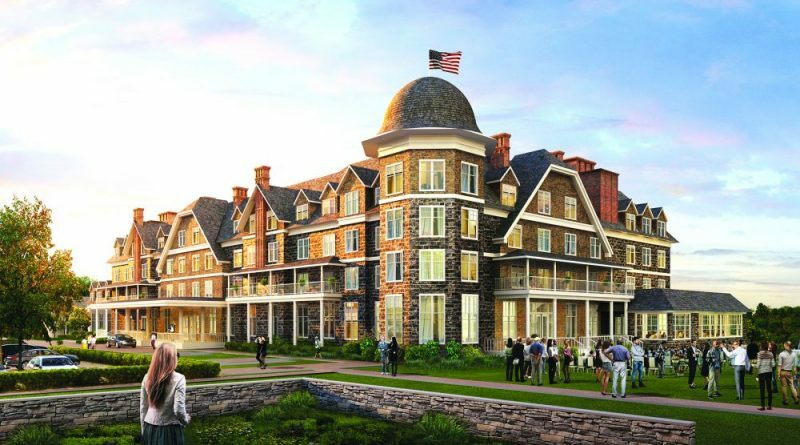 A rendering of the proposal to renovate and expand Hill Top House hotel overlooking Harpers Ferry. 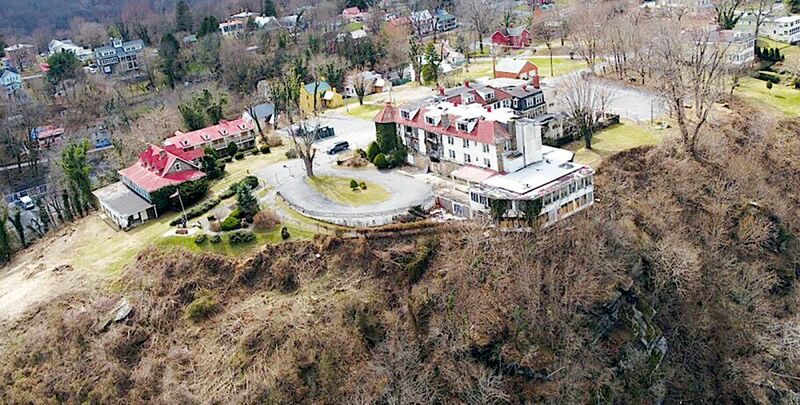 For decades, Loudouners have fallen in love with the quirky and magical Hill Top House Hotel in nearby Harpers Ferry, WV. The hundred-year-old structure has enchanted tourists and locals alike with its air of mystery and one of the best views of Harpers Ferry in the region. But for the past 10 years, the building has been shuttered and in disrepair. Now, Loudoun power couple Karen and Fred Schaufeld are moving forward with plans to redevelop the building as a luxury hotel with a sense of history, restoring a crumbling icon to its former glory. And while the Schaufelds have hit a few bumps in the road with local government across the state line, they’re now confident things are on track with an eye toward a 2022 opening. The Schaufelds, who live near Leesburg, fell in love with the property during their early days in Loudoun in the 1990s, making regular day trips to the hotel for a meal and the amazing view. But by the end of the 20th century, the building was already beginning to deteriorate. The Schaufelds bought the property in 2007 through their investment firm, SWaN & Legend Venture Partneers, and closed the hotel the following year as it became apparent that structural problems made it unsafe. Redevelopment was always the plan, but zoning issues with the Town of Harpers Ferry held up the process. But with a new redevelopment plan submitted last spring and widespread support from the local business community, Schaufeld is confident they’re now on track. Leaving time for final changes developed with the town to move through the Board of Zoning Appeals, the developers hope to get construction rolling. “I would be very happy if we can get all this done and under our belt and break ground before the end of the year,” Schaufeld said. The hotel, originally built in 1888 by African American businessman Thomas Lovett, burned down and was rebuilt twice in the early 20th century. Over the years, the hotel hosted luminaries like Mark Twain, Alexander Graham Bell, W.E.B. Du Bois, Pearl Buck, Bill Clinton and other U.S. presidents. The Schaufelds’ vision is a world-class hotelinspired by Lovett that would attract leaders, history buffs and wine lovers alike. “I want this to feel like America’s living room, like you can come in, sit down and be looking around you and see with the artwork and the finishes and the artifacts that you’re surrounded by things and people that happened there,” Schaufeld said. For longtime Loudouner and new Harpers Ferry resident Morgan Morrison, the redevelopment plans bring a mixed sense of nostalgia and anticipation. An aerial view of the Hill Top House, which has been closed since 2008 because of structural concerns. Morrison and her husband David Van Deventer, who make up half of the noted local traditional music band Furnace Mountain, grew up in Loudoun and lived in Clarke County before moving to Harpers Ferry last June. Morrison has fond memories of regular trips to Harpers Ferry as a kid, and she and Van Deventer ran beloved weekly Sunday afternoon Irish music sessions at Hill Top House in the mid-2000s before its closing. Morrison and Van Deventer connected with fellow musicians from Loudoun, Maryland and West Virginia at those Hill Top sessions a dozen years ago, creating a musical community that still exists. With some of the same talented tri-state players, the couple now organizes Irish sessions at The Barn of Harpers Ferry on nearby West Washington Street. As new Harpers Ferry residents, Morrison and her family have fallen in love with the community, which she believes is largely in support of the Hill Top plan. For Morrison, plans to rebuild the hotel mesh well with the trend of redevelopment in the community beyond the well-known “lower town” tourist areas, including new bars and restaurants at the upper end of town and a trend toward renovating run-down historic homes. For Morrison and other locals, including a coalition of Harpers Ferry small business owners, the economic development implications are huge, and on the Loudoun side, the hotel offers the prospect of needed lodging for visitors to Loudoun’s farms, wineries and breweries. For Schaufeld, a Loudoun resident since 1991, the synergy with Loudoun’s agritourism economy is a big plus, but the redevelopment is also a passion project, restoring a special place to its former grandeur after a frustrating decline. For more information on Hill Top House redevelopment plans, go to hilltophousehotel.com. This is great news. I love Hilltop. Glad to see it being brought back.